Hundreds of free Super Bowl theme party ideas. We know it's about the game (and the commercials!) but we also include super ideas about decorating the playing field, oops, we mean your house. Super Bowl 53 Party Ideas - Our most popular Super Bowl Party. 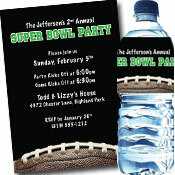 Features Super Bowl XLIII invitations and party supplies! Winter Theme Super Bowl Party Ideas - It's not always warm at the Super Bowl! You may be cold but this party will warm all your guests with good food and a great game! Texas Style Super Bowl - Everything is bigger at this western Super Bowl party. The perfect excuse for a big pot of chili and some tex-mex dip on Super Bowl Sunday! Super Bowl Fiesta - You'll need a siesta after this Super Bowl fiesta! Mardi Gras Super Bowl - Looking for something different this year? Throw a Super Bowl party worthy of the Big Easy. Great theme for Saints fans too! Luau Super Bowl - It may be winter, but this Super Bowl theme is HOT! Taste of the NFL - A yummy theme that also helps those in need. 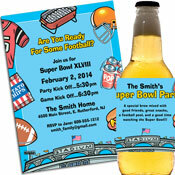 The perfect Super Bowl Fundraiser Party. 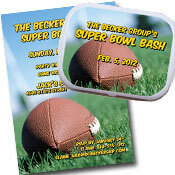 Give you super celebration the personal touch with our great Super Bowl invitations, decorations and party favors.